"My legacy with the world would be, I would want them to know that I lived for God, I was faithful in my life," the 29-year-old Brooklyn Nets point guard said on The Playbook, a podcast hosted by David Meltzer of Sports 1 Marketing. "I wasn't perfect, but I always did my best and I tried to fix and right my wrongs and just do things the right way," Lin continued. Metzler asked what kept Lin going, pointing out that he wasn't heavily recruited for college basketball—despite going on to set records. "A lot of it really is just faith in God's divine plan. I remember when I made it to the NBA ... I remember I actually, physically wrote down a list one day and I was like, 'If any of these one things didn't happen, I wouldn't be here today,'" Lin said. "It was a long list of maybe about 13 to 15 things, and I made sure that everything on that list was out of my control...so that's the first thing I need to do is not take credit for a lot of outside things," he continued. Lin said he's leaning heavily on his faith now since a knee injury forced his season to an early end. "There is a lot of delving into God's promises that there is a perfect plan, that I need to just continue to be faithful and worry about what I can control ... 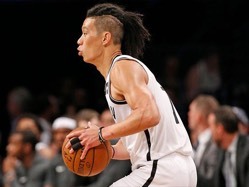 I do feel like I'm in God's favor," Lin told Metzler. "My older brother said it best. He said, 'When I look at your story there are God's fingerprints all over it,'" Lin continued. He says he considers his "off-the-court job" to be figuring out how to use his platform to create the most impact—specifically in China because of the power of his "brand" there. "There's many things that I'm able to do," he said. "We talk a lot about how to make it right, what vision, what brand, what path we want to take, and it's been enlightening ... we spent a lot of it thinking about China and how we can help." Lin says he has a lot of fun, but he also tries to create, "legitimate change in people's lives."